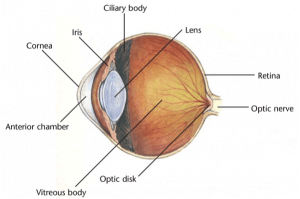 The retina is a very thin tissue at the back of the eye (behind the iris and lens) that is closely associated with many small blood vessels that supply it with oxygen and nutrients. When systemic blood pressure rises to over approximately 180mmHg, changes start to become evident in the retinal vessels. First, the vessels appear more tortuous. This is analogous to high-pressure water flowing through a very small diameter soaker hose. With elevated pressure the hose becomes stiff (torturous), and if the pressure stays high the hose either continuously leaks excessive amounts of water or bursts. The same scenario occurs with the vessels at the back of the eye. These vessels will either leak too much fluid or burst causing areas of retinal hemorrhage. In both cases the fluid or blood lifts the retina away from its normal supply of oxygen and nutrients (called a retinal detachment). The greater the retinal detachment, the greater the vision loss in the pet. Vision loss, which may be progressive or sudden. With sudden vision loss owners are more likely to see their pet bumping into objects. One or both pupils may appear large or dilated in all light conditions. If only one eye is affected, the pet may seem wary of stairs or misjudge distance when jumping onto objects. In the majority of cases, Schirmer tear tests, fluorescein staining and intraocular pressures will be within normal limits. Slit-lamp examination of the front portion of the eye may reveal poor to absent response of one or both pupils to light. Indirect ophthalmoscopy to look at the back of the eye may reveal changes to the retinal vessels or complete to partial retinal detachment. Blood pressure must be measured to ensure that the ocular changes are attributable to hypertension and to establish a reference point prior to starting therapy. 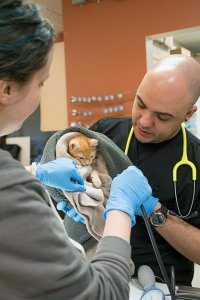 Blood work including a complete blood count, serum chemistry analysis (with thyroid levels in cats), and urinalysis are also essential to determine if there is an underlying cause for the blood pressure elevation. Although systemic hypertension often presents as an ocular problem, it has major impacts on other organs (such as the kidneys, heart, and brain), and the effects on these organs can be life-limiting if not controlled. The prognosis for return of vision is fair. Once the hypertension is controlled, the fluid or hemorrhage causing the retinal detachment is slowly reabsorbed. The retina will often reattach, sometimes with partial return of vision. The overall prognosis varies depending on the underlying cause of the hypertension and how well the hypertension is able to be controlled. Most causes of hypertension require lifelong management with medications and routine monitoring of blood work and blood pressure.